History of the Springs and Wells movement in the Malvern Hills, Part 2. As the Millennium approached, springs and wells continued to command interest from the public but there was a period of several years when no new major initiative advanced the theme. The Malvern Spa (formerly Tourism) Association (MSA) was now re-activated under the chairmanship of John Ford, using the residual funding generated earlier. The committee comprised Angela Lessimore, John Tretheway, Bruce Osborne, Cora Weaver, David Hancock, Jim Black, Carol Marsden and Carly Tinkler, meeting for the first time in full in October 1998. Rose Garrard, Bob Embleton and A Clark subsequently also participated. The problems of funding were recognised from the start especially as the Associations key role was seen as restoration of the springs and wells. Lists were drawn up of projects and possible funding opportunities. The Association was formally relaunched at a meeting at the Foley Arms on 17 Feb. 1999. Extracts from Aquae Malvernensis were used to promote this public meeting and the authors, Cora and Bruce did an illustrated lecture on the Springs and Wells. The meeting was well attended and a newsletter initiated. One item of news covered in the newsletter was the possibility of Rose Garrard planning a further major water feature in the town centre for the Millennium, following the inauguration of the Malvhina Fountain. As a result, the Elgar Enigma Fountain, also sited on Belle Vue Terrace was unveiled by The Duke of York and this was to be one of the highlights for local enthusiasts in the Millennium year. It was immediately apparent however that during the late 1990s efforts by the MSA to orchestrate restorations and renovations was going to be slow and torturous in coming to fruition. Whilst schedules were prepared and debated nothing much was to happen until the new millennium. In the year 2000 effort was directed at securing a Heritage Lottery Fund grant and the protracted process of preparing and submitting an application was underway. Other issues that entertained included the competition to name the new fountain in Back Lane following the covering of the Priors Vineyard Spring with the new Waitrose Car Park in the year 2000. There were also signs of tensions however. The MSA sought to build a web site and caution was expressed in April 1999 about the use of material from Cora's and Bruce's books not in the public domain. Meanwhile others were also pursing the theme of restoration and renovation. Individual projects where there was some progress, included the Temperance Fountain, which had water reinstated and some ancillary posts installed as part of a landscaping scheme. One interesting episode in 2001 involved the opening of the underground reservoir at Clock Tower. Malvern Town Council owned the site and the MSA parted with a sum of money to enable a proper trap to be inserted in the structure for access. The Town Council however then decided that access could only be allowed for insured persons. Insurance documentation was duly submitted and the Foot and Mouth crisis abated but it was some time before a group of enthusiasts finally got to see the cathedral like interior. By 2001 there was a regular Wet Weekend in the Autumn. This celebration included the legendary Springs and Wells coach tours and the well decorating. The same year also saw the launch of a third edition Springs, Spouts, Fountains and Holy Wells, authored and published by Cora and Bruce. This book was the updated edition of the popular guide to the springs and wells and provided new information based on research about the provenance and number of sites around the hills. Eighty eight springs and wells were included. In 2001 the Association sought to strengthen its position by becoming incorporated with the Malvern Civic Society, a move that was to prove problematic in later years. The status would be that of a sub-committee with the 1st June being set as the transfer date. John Ford was considering retiring as chair of the Association and this was seen as a timely way of providing continuity. The MSA were inclined to view it as a merger whereas the Civic Society saw it more as a way of expanding its existing activities and membership. Intent on promoting Springs and Wells John Ford started work on a Trail Guide in September 2001. The guide was to be published by a commercial publisher. This was to cause some dissention because the content proposed was largely derived from the book Springs, Spouts, Fountains and Holy Wells (2001) and as such the guide would be in direct commercial competition with the privately published book. Furthermore the Trail Guide was to be sponsored by the Civic Society/MSA to the extent of three hundred pounds whereas the book had been privately funded. By May of 2002 a way forward in resolving these tensions had been contrived. In order to overcome the conflict with their researched material, Cora and Bruce rewrote the Trail Guide. In an exchange of letters with the publisher it was agreed that any copyrights and intellectual properties of Cora and Bruce used in the guide were licensed for use for publication in the current edition only. This was an uneasy compromise but precipitated an era of dissonance that was eventually to lead to the break up of the group. By 2002 the well decorating and coach tours had been retimed to coincide with May Day weekend celebrations in Malvern. In May 2002 the MSA launched a Pilgrim Flask. This glass vessel celebrated the MSA and the Golden Jubilee. It was available in a limited edition, selling at about thirty five pounds each. One was sent to the Queen. Her reaction is unrecorded; perhaps she wondered where the stopper had gone! In the same year John Ford retired as chair of the MSA and Carly Tinkler took over the role. Other events in 2002 also included the launch of a Well Wardens scheme with support and leaflets sponsored by the Civic Society. This was organised by Bruce and Cora and aimed at keeping an eye on key sites. This ranged from liaising on keeping springs and wells tidy to alerting in case of threat. At about the same time the Civic Society was expressing concern that the MSA was not integrating into Civic Society activities but still proposed ratifying the merger after a one year trial period. In September 2002 it was announced that a bid for HLF monies for springs and wells had been successful. This promoted a new enthusiasm amongst those who had assisted in developing the proposals. It was going to be years however before implementation and 2003 was one of the quietest years for the springs and wells movement since their inception in 1992. The spring of 2004 brought another problem that was addressed this time by the Spas Research Fellowship in conjunction with Cora. The Malvern Town Council decided to desecrate the local churchyard in the interests of public safety by toppling the grave stones. One hundred and twenty nine monuments were legally vandalised including that of Dr Wilson the famous water cure doctor. The Fellowship immediately put out an international appeal on their Spagazer email news inviting spa enthusiasts to write to the Council. Within a few days Dr Wilson's family monument had been reinstated. In August 2003 the Civic Society was expressing serious concerns that the MSA was failing to integrate, in spite of formal affiliation being agreed. There then followed a period of disharmony until on 5th May 2004 the Civic Society formally decided to terminate the incorporation of the MSA forthwith. This precipitated a debate about the future of the Well Wardens and following an acrimonious letter from the MSA, a discussion paper was drawn up by Bruce, Cora meanwhile promptly resigned from the MSA. By August 2004 the view was being expressed that a new organisation was required for springs and wells following complaint and comment from various individuals. While the Civic Society pursued its continuing interest in the theme, the Malvern Spa Association had decided to launch its own look alike Well Wardens scheme. Bruce tended his retirement from the Malvern Spa Association in September 2004, leaving the way clear for Cora and Bruce to form Friends as a new interest group. First however Cora and Bruce prepared and published their Great Malvern Water Trail - a town trail of interesting sites with their provenance. This was published in time for Xmas 2004 and has proved a popular, low priced introduction to Malvern's water heritage. Meanwhile the Civic Society continued its interest in springs and wells. A meeting about Malvern Springs and Wells was programmed for February 2005. Also by November 2004 the Civic Society was planning on assisting with the restoration of the Foley Fountain at Mount Pleasant. This subsequently was carried out under the direction of Cora, thereby preserving for the future this early basin that once resided at St Ann's Well for Princess (later Queen) Victoria. A protecting canopy was seen as necessary addition in due course. The Civic Society subsequently had a packed house at their Springs and Wells lecture 11 Feb 2005 welcoming the Well Wardens. Cora and Bruce entertained the assembly with a resume of the history of the now famous sites. While the Malvern Spa Association pursued well decorating and future restorations with the HLF monies, the now independent group of Friends developed a programme of events including the legendary annual coach tours, special interest meetings and town trails. Malvern hit the international media in November 2004 when headlines such as 'will bleed the hills dry' referred to an application by Coca-Cola Enterprises to enhance their natural water supply at the Colwall bottling works. Hoping to use a supplementary water supply from Walms Well, the MSA orchestrated a campaingn of objection. The situation quickly got out of hand with local 'experts' voicing opinions that were arguably uninformed to say the least. The result was that Coca-Cola withdrew their application. Fortunately someone in the corporate affairs department of Coca=Cola at the time refrained from putting a red line through Malvern Water and terminating the last remaining Malvern bottling works and the employment for two dozen local people. The following February the Civic Society were invited to a tour of the Bottling Works in order to gain a balanced perspective on the still volatile situation. Subsequently, in 2010 the bottling works was closed by Coca-Cola. The Walm's Well application and the resulting bad publicity causing a withdrawal of the proposal are seen as a root cause for the closure. Such issues as the Colwall Bottling Works controversy and the confusion caused by the Well Wardens look alike scheme marred the real successes of the winter of 2004/5, which included the progress with restorations through the Civic Society and the HLF funding coming slowly to fruition. The Golf Club Spout was put back in water by local enthusiasts and new archaeological finds unearthed historic water features, hitherto lost. By March 2005 it was apparent that a new interest group, formed from the various disparate enthusiasts operating under various banners was overdue and Friends of Malvern Springs and Wells was devised as an all encompassing title. This essentially created two rival groups, the Friends and the Malvern Spa Association. Particularly because of the problems emerging on the question of public liability, in 2005 the original well wardens were absorbed into Friends, with Cora and Bruce at the helm. July 2005 also saw a major new initiative from Friends with the launch of the St Werstan Award for the conservation and renovation of Malvern springs and wells. This was in conjunction with Malvern Natural Mineral Water. The scheme was unusual in that Friends were the judges rather than having an independent panel of experts pontificating. St Werstan was one of the earliest saints to be associated with Malvern's Springs and Wells and it was fitting that his name was being linked with this new scheme to encourage enhancement of Malvern's water heritage. The Award represents a public recognition of outstanding endeavour in the conservation or renovation of Malvern springs and wells and their immediate environment. Friends, local residents and visitors nominate sites for an award by forwarding a short resume of the circumstances and location. Nominated sites are featured in a short critique in the Friends Newsletter. Friends of Malvern Springs and Wells are then be able to express their views as to whether nominations justify the award by completing a simple appraisal. The use of St Werstan for the award had an interesting repercussion. It prompted scholarly interest in the saint, who for many had been dismissed as a fabrication. It quickly became apparent that the popular legend was flawed but that there was some substance in the underlying historical record. Werstan was a monk who, in the times of Edward the Confessor, left the monastery at Deerhurst to found a cell in the Malvern Hills. It is believed that St Werstan founded his hermitage in the valley below the present day St Ann's Well building. He lived in a cave initially in the local Devonian outcrop and his martyrdom occurred in the early 1050s when the Celts attacked the area. He was replaced by Aldwyn who received a charter from Edward the Confessor. Werstan's hermitage became the founding site for the first formal religious establishment during the reign of William the Conqueror and this led to the eventual establishment of the priory and Malvern town itself. It is likely that the spring and streamlet in the locality was venerated in the early days as a healing spring named after the martyred saint. A scholarly Occasional Paper was subsequently published in 2006 in conjunction with Friends, called The Illumination of St Werstan the Martyr by Cora Weaver and Bruce Osborne, presenting new thinking on this saintly figure who was adopted as patron saint of the local springs and wells. By the end of 2005 Friends were also able to announce the first recipients of the St Werstan Award. Julie Wollaston and Roger Moss celebrated their magnificent conversion of the old toilets at Malvern Link on 13th January, when they received the St Werstan Award for the enhancement of our water heritage. 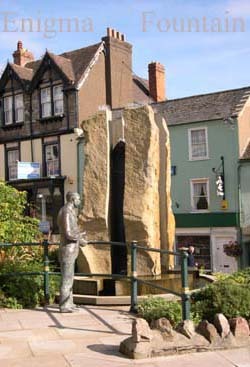 Friends voted on the nomination and Penny Cottage and the adjacent Osbornes Fountain becomes the first site to enjoy the award. The hand cast brass plaque was presented by Mr Jim Fox of Malvern Natural Mineral Water and reflects their support for environmental issues. When Julie and Roger first purchased the old toilets, they were derelict with the ladies and gents separated on different floors. Other features apparently included someone living in the roof space and endless small windows to the cubicles. Many, but fortunately not all, of the original features have been retained. A new staircase extension was also provided, making the building a unique 'des res'. Had the building been demolished and the site redeveloped it is likely that Osbornes Fountain would have been under serious threat. Now it is reasonably secure in the boundary wall. The end of 2005 also saw the naming ceremony of a new water cascade at St Ann's Well. The County Council as grantees and the AONB Officer had made serious progress with the deployment of the long awaited HLF monies and St Ann's Well became the first flagship project. Minstrels accompanied the lively proceedings and there was a good turn out of spectators. The newly named Old Moses Spout was the renovated water cascade at the side of the entrance to the building at St Ann's Well. Until recently it had been a water spout that ran dry for a large part of the year. Although its name suggested that it was old this was not so, having just been rebuilt. It was named after a supposed donkey who carried Princess Victoria to St Ann's Well, another misconception. Once again the public saw a donkey at St Ann's Well sampling the water of the new cascade. Unfortuntately it ran dry soon after. Other landscaping included the pond outside the well. Details of other renovations to springs and wells planned were given in the Friends Newsletter of January 2006. This comprised 6 major sites and 7 minor renovations. As the second seven years of the springs and wells movement drew to a close in 2006, the picture was vastly different to what might have been anticipated. Public awareness and support had blossomed and springs and wells had become embedded in the community culture. In spite of this the Malvern Spa (Tourism) Association, there at the outset, had failed to act as a unification force and focus for local enthusiasm and interest during this second 7 year period. Although reformed as a specialist interest organisation it had divided rather than united those it sought to serve. Elements within the Association had been catalysts to the disruption and break up of the body of enthusiasts. Friends of Malvern Springs and Wells by summer 2006 was the largest and most dynamic of the interest groups, while the MSA concentrated on its inherited responsibilities with the deployment of the HLF monies for restorations and well decorating. In July 2006 John Ford died after a battle with cancer. His earlier leadership of the MSA, before its transfer to the Civic Society and subsequent independence, had led to the securing of HLF funding for the restoration of the springs and wells. As such he left a lasting positive legacy. After July 2004 the Friends of Malvern Springs and Wells Newsletters, which are published on-line at www.malvernsprings.com provide a diary of the continued evolution of interest and activities associated with Malvern's water heritage.